Hillary Clinton is scheduled to make one of her first public appearances since stepping down as Secretary of State in February when she appears Friday at the annual Women in the World Summit 2013 being held in New York City. Even with 2016 far off, there has been much speculation about whether she will once again re-enter political life to make a bid for the White House. Over the course of her long political career, Clinton truly had been a comeback kid as measured by her standings in the polls. On four separate occasions over the past 20 years, Clinton’s favorability ratings have fallen sharply — but each time they recovered. It is rare for a political figure to accomplish that feat once in a career, much less four times. (See a timeline of her career). In a December 2012 survey, Clinton’s popularity was approaching an all-time high, although the poll was conducted just before the controversy over the bombing of the U.S. consulate in Benghazi, Libya. Nearly two-thirds (65%) said they had a favorable impression of her while just 29% had an unfavorable view. 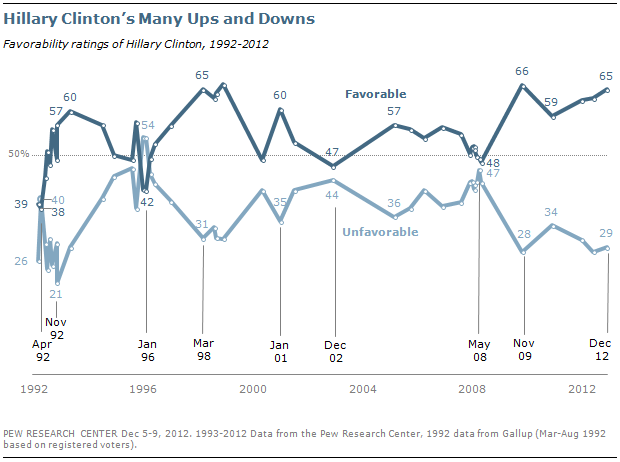 Throughout Clinton’s tenure as secretary of state she enjoyed consistently high favorability ratings – at least 60% or so. But her ratings during the previous 17 years were often quite mixed.